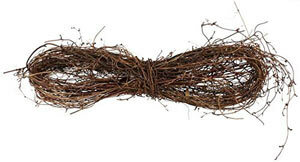 Grapevines, bound together, make a perfect base for a rustic wreath. When you make your own, you have the ability to form any shape or size that you wish. If you can’t harvest your own vines, then you can purchase grapevines that have already been dried. I’ll explain how to make a grapevine wreath in both a circle and heart form. If you can make a big circle and do a lot of winding and twisting, then you will have no problem doing this craft. 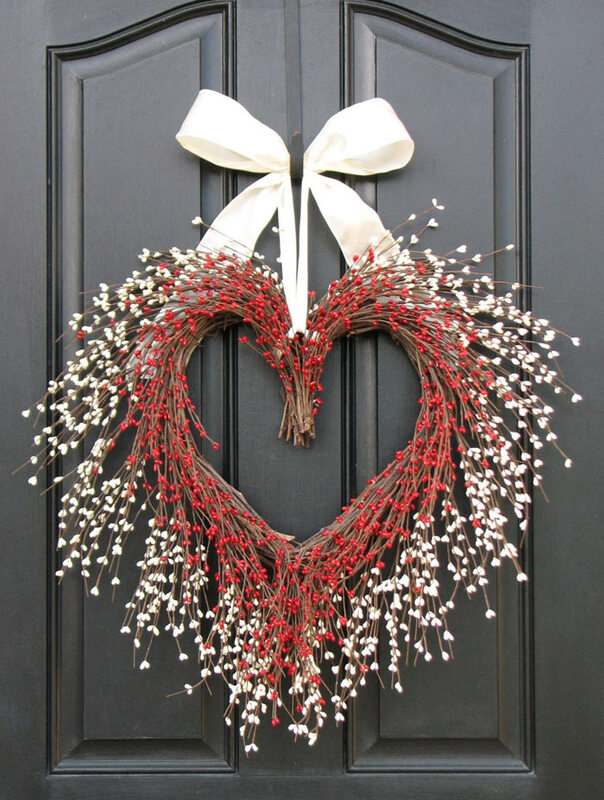 It would get a little more advanced if you wanted to do a heart shape for a Valentine’s holiday wreath, but even that is not too difficult. Here are the easy instructions for both shapes. Remove any foliage from the vines. 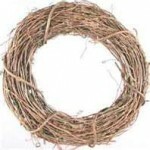 Make a circle, the size you want your wreath to be, with one of the vines. With the remaining length of vine, begin wrapping it around your circle to hold the shape in place. Keep adding more lengths of vine, weaving them in and out of your circle until you have the thickness that you want. Use the bark covered wire in spots to help hold the shape. The wreath should now be nice and secure. Tuck in your floral picks where you want them. They should hold in place with the tightness of the vines alone but you can secure them with some bark covered wire. This wire blends in perfectly with the grapevines and won’t be noticed at all. Holiday wreaths are great to do this way especially for rustic Christmas decor. 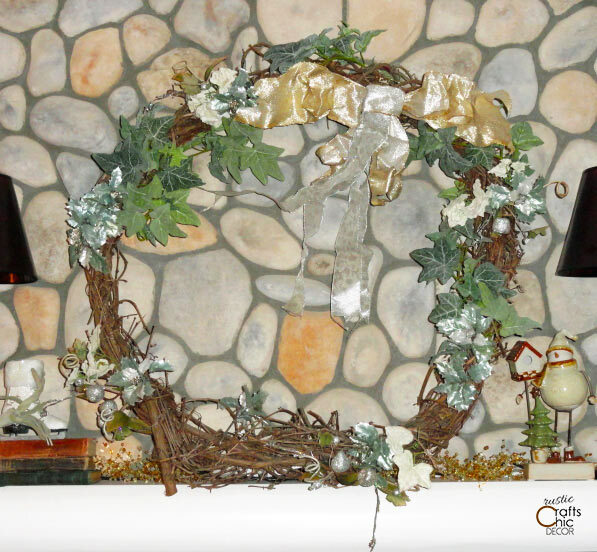 I like grapevine wreaths all year long and there are plenty of ways to decorate them, either seasonal or all year. Floral picks with rustic tin stars and pip berries are a great addition for a year long wreath in your rustic decor. For this wreath, I used a variety of different leaf shapes and shades. First, I applied some hot glue onto the stems and then stuck them in between the grapevines. I added a gold bow to go with some of my other decor on this winter mantel. 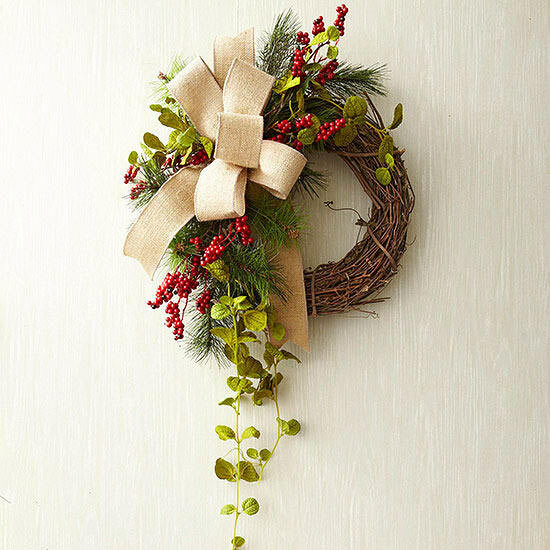 For more of a year round wreath, just use less shiny leaf picks and a burlap bow. This wreath is all decked out for Christmas with the red berries. Use white berries for a more neutral winter wreath. Or, add in some florals or cotton balls for a springtime wreath. As you can see, using cotton balls gives a nice neutral look that works all year long. This style is especially great for a farmhouse style home. If you want to make a heart shape, start out by making a long straight bundle of grapevine. Twist several together until you have the desired thickness. Now bring the two ends together and down a little bit in the center. Wrap some more grapevine around where the ends meet to hold them together. 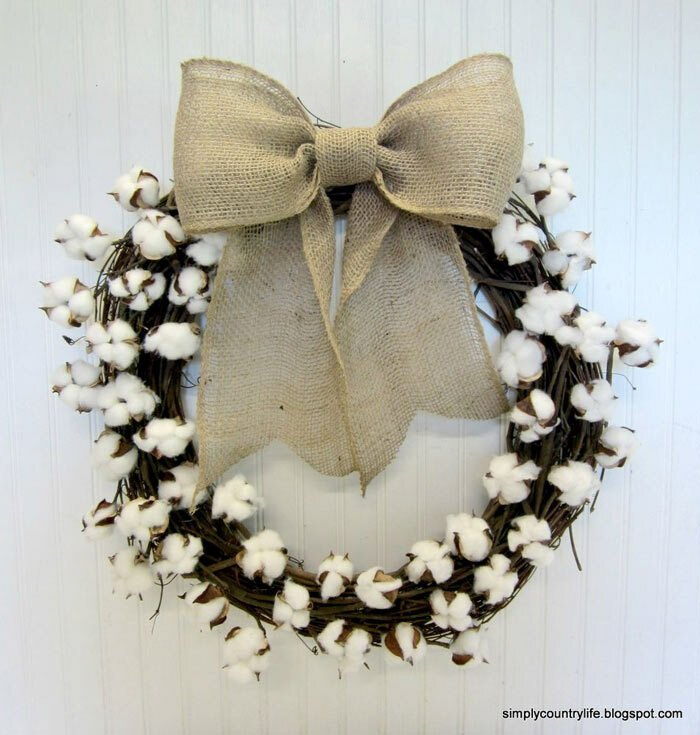 You can also use some birch bark covered wire to hold the wreath in it’s shape a little better. 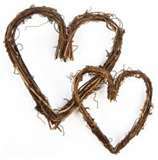 Another option is to use a heavy gauge wire or coat hanger, in the shape of a heart, as your base and them simply twist the grapevines around the wire until you have the thickness that you want. I love this shape especially for Valentines day. 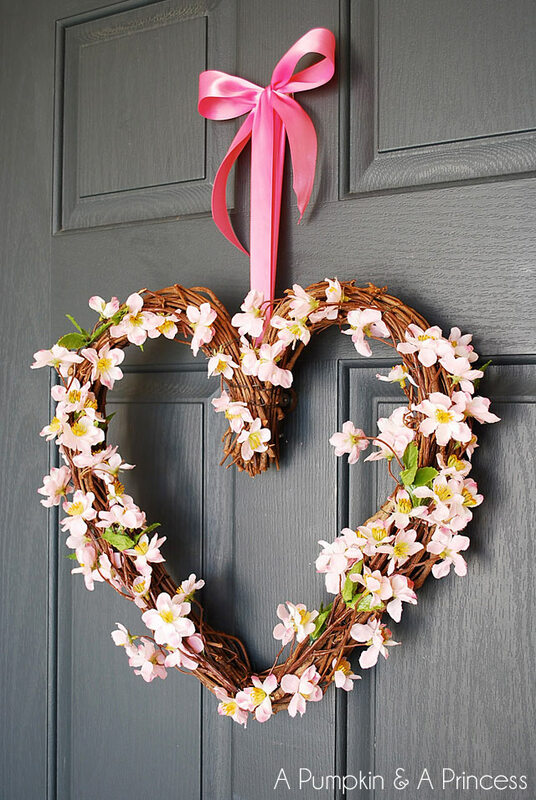 This sweet valentine wreath is easily made by inserting delicate pink flowers. Other ideas are to use red flowers or white and red pip berries. I found this wreath on Etsy so there is not a tutorial. However, I thought I would include it for inspiration.